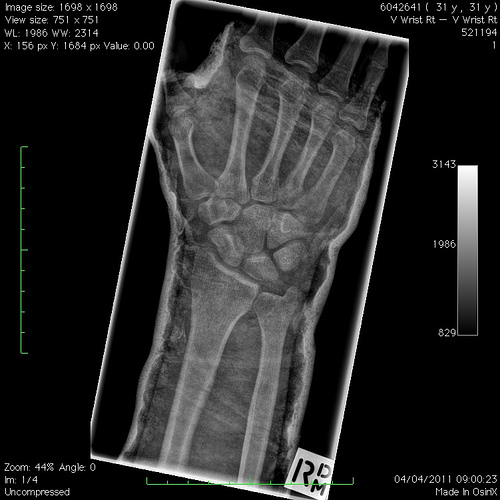 Health Costs > How Much Does a Wrist MRI Cost? How Much Does a Wrist MRI Cost? Magnetic Resonance Imaging, more commonly known as an MRI, is a medical diagnostic test done to scan or examine a body part using a magnetic field or radio waves. The signals detected by the procedure are then sent to a computer for image processing and production. Some MRI scans are done with a dye or a contrast to facilitate imaging and enhance the accuracy of the test. On average, the cost of a wrist MRI is going to vary anywhere from as little as $600 to as much as $2,200 without any sort of health insurance policy. However, for those who do have a health insurance policy, be sure to check with your insurance company to see what is going to be covered. Most of the time, as long as it is medically necessary, the patient will only be responsible for their co-pays and deductibles. If you do not have an insurance policy or are looking to make a switch, eHealthInsurance.com allows you to browse and shop through hundreds of policies for free. An MRI on small joints, such as the hand or wrist, costs $895, according to the Imageonemri.ca. The Healthbluebook.com says that the cost for Wrist MRI without contrast is around $553. The price includes the combined fees for professional interpretation and technical imaging. SaveOnMedical.com, a company that allows you to book your wrist MRI online, has providers in Tampa Bay, Florida, for example, charging $416 and more. New Choice Medical says a fair price to pay is about $575. An MRI scan which uses dyes or contrast will be more expensive than MRI procedure which does not need it during the process. Hospitals or laboratories from different states in the U.S. have varied rates for MRI scanning procedures. With anything in life, the geographical location plays a big role in the pricing. The cost of the MRI scanning procedure will also depend on the type of insurance you have. Most clinics and labs put up varied rates for HMO, PPO, or health cards if you do not have any insurance or any form of health assistance at all. Before the procedure begins, the patient will have to remove any sort of metal jewelry. The patient will then have to lay on a table, which will then be entered through a tube for a test. Although it is painless, some that have claustrophobia may find it to be an issue. Once inside the machine, the radio waves will send results to a medical professional, who will then analyze them. The procedure only lasts a few minutes and the patient can immediately go home afterward most of the time. Wrist MRI costs usually include the professional fees for the technician who performed the procedure. The cost also includes the technical process and the interpretation of the results by a licensed radiologist. In cases where MRI contrast is used, the price for the dye or the contrast medium will be included in the overall cost of the wrist MRI scan. Also included in the cost is the patient’s copy of the results of the scan. Getting an MRI with contrast will be an additional cost with most facilities. If you were to need contrast, this could add another $100 to $350 to your price. Since laboratories have strict schedules, you may be charged a cancellation fee if you fail to cancel within 24 hours prior to the scheduled appointment. If the wrist needs surgery or physical therapy down the road, these are additional costs to consider. It is important that you ask your physician everything about the procedure. It is your right to know about the purpose, contraindications, side effects, risks, and advantages of the procedure or other possible options other than the MRI. If you are to use a health insurance for your MRI procedure, make sure to clarify with it with your health insurance provider if the policy covers diagnostic procedures as wrist MRI. Make sure you ask if there is anything you need to do in preparation for the test. A good doctor/facility should provide you with paperwork before you arrive for your appointment. Many facilities are more than happy to set up payment plans or even offer cash discounts. A free-standing facility will always be cheaper than a hospital. If at all possible, always try to have your MRI done at a local free-standing center.